The volcanic origin of this island is evident; the clear demonstration of it are the three mounts which compound it: Mount Fossa delle Felci on the east together with Mount Rivi on one side, and the third mount on the west separated by the creek, Mount dei Porri (860m high). The two twin mountains making part of the Salina island represent the first and the third peaks of the archipelago, and the contribution of this lush are the passing clouds, which are captured by high peaks, in order to give humidity to the soil. The island is formed by six collapsed craters; between them those of the most ancient formation of Pizzo di Corvo, mount Rivi, and the other ne near to Capo Faro, now unrecognizable in their morphological structure. The geological history of Salina started 500.000 years ago with the creation of the first volcanic building in the current north-western zone; the same is the age of the volcanic constructs of Capo Faro e Mount Rivi. After a long period of quiescence the creation of the quarter of the volcanic building happened, corresponding to the nowadays Fossa delle Felci. Because of the elevated height reached by this cone they think it was formed by mighty extrusive eruptions, which covered the greatest southern part of Mount Rivi. 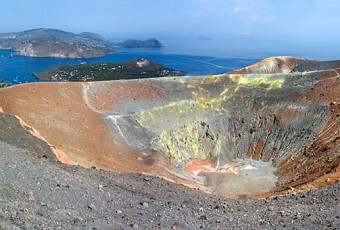 The Fossa delle Felci is the best-conserved crater; easily recognizable are the forms which compound it, and now extend for 500m of diameter. At about 100.000 years ago dates back the formation of the volcano dei Porri, which as a cause of a consequent explosive eruption, provoked the destruction of the north-western side, with the consequent creation of a new crater; that of Pollara reaching a diameter of 1km. This one, partly destroyed because of the erosive sea’s action, shows from the beach the stratification of white pumice, andesite, mica, and hornblende. Next to the crater of Pollara there is the Faraglione Rock, the volcanic neck, formed from the solidification of magma in the crater, visible thanks to the cone’s erosion, of a more friable consistence. Of a volcanic origin of this island only one phenomenon persists, the sconcassi, which thanks to a strong underwater emanation of sulphide hydrogen, are manifested from the seabed of Rinella.